Pokemon meets D&D? Let's talk MajiMonsters! You are here: Home / Geek Stuff / Interviews / Pokemon meets D&D? Let’s talk MajiMonsters! Pokemon meets D&D? Let’s talk MajiMonsters! At the start of the month Geek Native covered the launch of the MajiMonster RPG Kickstarter. I’m now a backer of Late Knight Games’ project as I think there’s a nice new take on a traditional RPG here. Dan Coleman and Jonathan Barron of Late Knight coordinated with me over email. In this quick Q&A interview we explore what makes MajiMonsters stand apart but also which RPGs have inspired the game. We talk about Kickstarter, art and, of course, monsters! Can you describe MajiMonsters in just a few sentences? MajiMonsters is a marriage of tabletop fantasy role-playing with the monster-catching genre. In the game’s setting the world has fallen to disarray and humanity has retreated behind walled towns and cities for safety from the Monsters that rule the ruins of an empire long lost. The way to control these Monsters has only very recently been discovered: by binding their essence to magic crystals called drajules. Players take on the roles of heroes called “binders” that are capable of this task. Binders use their bound Monsters to fight other Monsters and perform extraordinary tasks no human would be able to do. MajiMonsters includes the same feel and tactical strategy gamers are likely familiar with from similar systems, with the added layer monster-catching and customization. Every encounter with a wild MajiMonster is an opportunity for a player to bind it, growing their retinue of companion Monsters and adding flexibility and options to their character. A gaming session of MajiMonsters might include a party of binders exploring an old tomb of the fallen empire lost centuries ago for a magic relic, it may have them challenge a party of rival binders or occultists in a battle against their own Monsters, it may have them try to negotiate with a town elder for access to his prized scripts or tomes, it may have them encounter a horde a wild MajiMonsters with the opportunity to bind one and forge a new companion- or some combination of all of those. Which anime and which RPGs have influenced the game? The easiest way we’ve introduced MajiMonsters to new players is as “Pokémon meets Dungeons & Dragons,” and that’s really a front running answer for each. 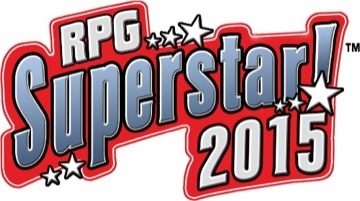 All the game designers are seasoned role-players, with tons of experience in d20 systems like D&D and Pathfinder, but also well-versed in other systems such as World of Darkness, Deadlands, Rifts, even Tales from the Floating Vagabond and many others. We started by trying to mold the game around and established system, but quickly discovered that wasn’t the right answer- so we started crafting and testing one of our own. Anyone that’s played D&D before should be able to pick it up very quickly, and it’s not long before new players are strategizing and really getting into the heart of it. There’s also some elements of tabletop war-gaming blended in, which we’ve found works great when a player has hordes of monsters at their disposal. We wanted to build MajiMonsters from the bottom up to suit the genre, and we’ve got something really unique here that fits it well. Which artists and illustrators have inspired the style in the book? Who would you like to work with in the future? Pokémon is definitely an obvious influence for us. We’re all big fans of the games and anime, and you can see it evident in the art style. We actually wanted to go in that direction for a couple of reasons. It definitely gives the game the anime “feel” best suited for it, and it also drastically reduces the time and cost necessary for the hundreds of illustrations necessary for the rulebook. I’ve actually done quite a few of the Monster and character illustrations myself, and the bulk of the Monsters are illustrated by Alexander Tansley, who’s incredibly talented. Which publishers and game designers do you think are being particularly innovative in the RPG sector? The 5th edition of Dungeons and Dragons is doing things previous iterations didn’t, and my local gaming group loves it. While it looks like Wizards of the Coast and Paizo Publishing will be vying for top dog with D&D and Pathfinder respectively, it’s hard being on Kickstarter and not looking at some of the indie developers. I mentioned Tales from the Floating Vagabond before, and it’s personally one of my favorites for its focus on humor. It’s also really intuitive and puts a lot of crunchier rules aside in favor what makes a good story. 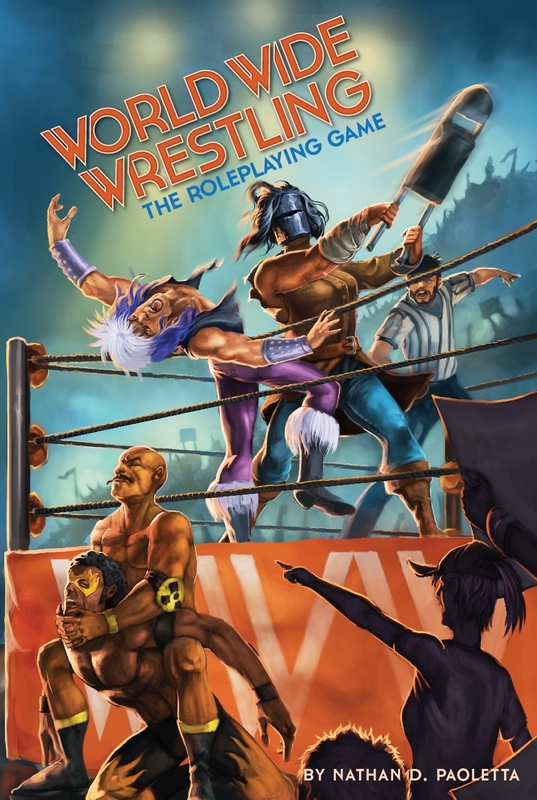 Just about all of us at Late Knight Games backed Lee Garvin’s second edition fundraiser. I’ve also got my eye on R.A. Salvatore’s current project Demon Wars: Allhart, which supposedly includes a system to run through a dungeon without the need for a Game Master. Nothing like that has ever been out there before. Which are your favourite MajiMonsters and why? Personally, I love Steinmaske. 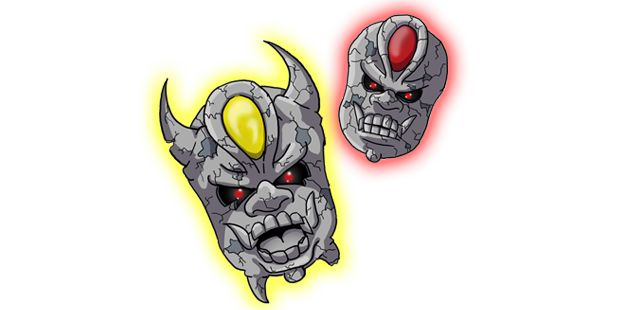 It’s an animate stone mask set with a precious gem that floats around and causes mischief. I also got to illustrate it, and I think the variety of the Monster and the game options it presents will go a long way with players. The fan favorite though is, hands down, Spiricoot. 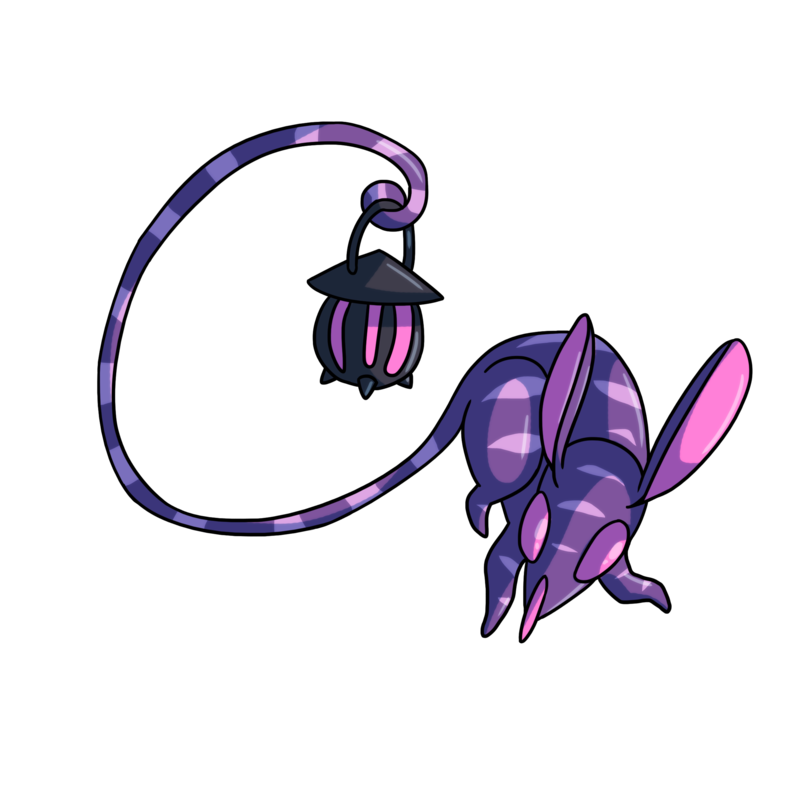 A purple and pink, mouse-sized Monster that hangs an eerie lantern from its tail. Spiricoot is talked of in the games setting as the usher between the physical world and the spirit realm, and certainly has an air of intrigue about it (and a certain amount of terror, if it reminds you of the tonberry from Final Fantasy). 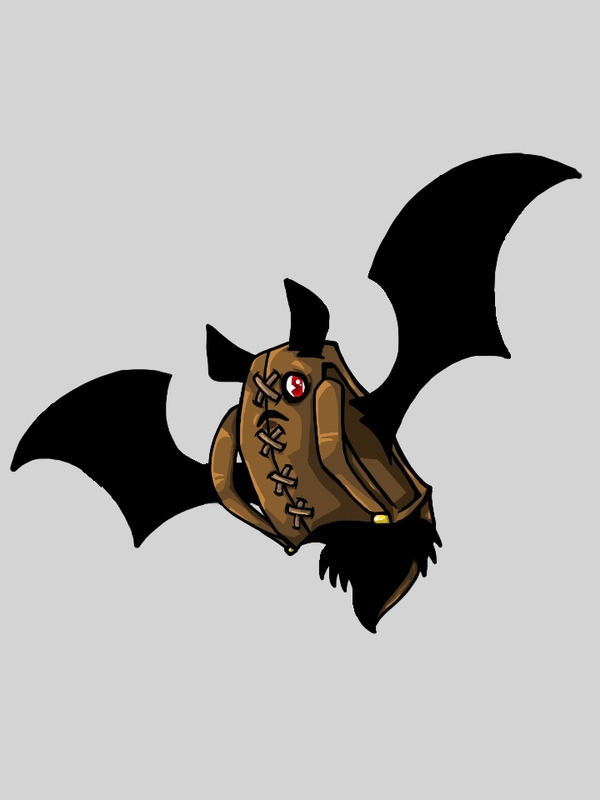 Can you tell us more about the community aspect of the game, such as letting fans make their own MajiMonsters? We went into this project with the goal to be community-driven. Largely, that meant including backers into the play-tests and using their feedback to refine MajiMonsters and make the final product the best game it could be. We also knew player’s would want to make their own MajiMonsters for use, so we’ve included our rules and guidelines for giving a monster stats, and also created a $250 reward tier where a backer could design a Monster to be in the official release. However, since we launched the campaign, people have come out of the woodwork to give us their ideas for monsters to include, but couldn’t afford the cost of the tier. 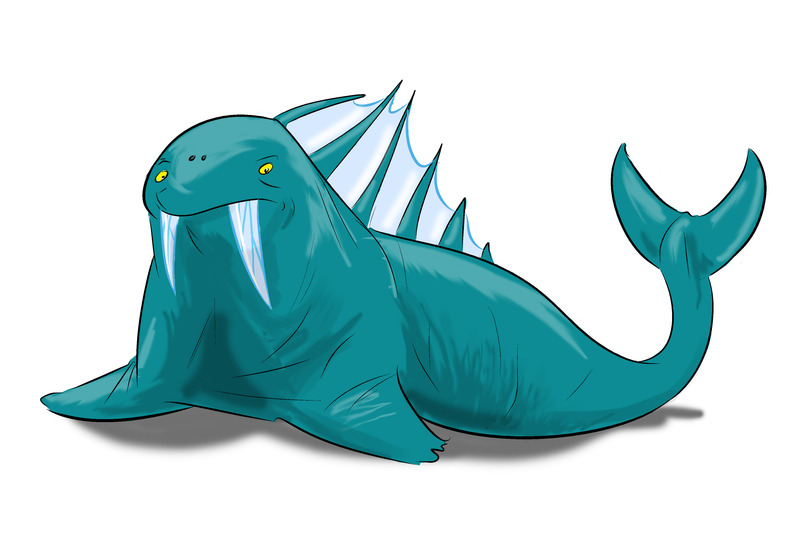 This prompted us to formally take submissions for a “Create Your Own MajiMonster,” of which we’ll select an illustration and description based monster and incorporate them into the Core Rulebook once it’s published. We’ve been really flattered by the amount of engagement we’ve received from backers and fans and the community that’s come together on this product. Our vision is to make a resource available for players to share ideas creations- perhaps a forum or something a little more formal- once the game is published. We’re certainly looking forward to it! How dependant are Late Knight Games on Kickstarter for MajiMonsters? Right now it’s our primary source of funding, so it’s safe to say it’s pretty important at this stage of the game. We’re poised for a big finish, and we’re hoping the “Final 48” hours give us a big finish over the goal line. We considered other options, but given the community aspect of the game, Kickstarter seemed the logical source. The first thing we’re immediately going to do is go into assessment mode. We’ve got our time-table planned out with plenty of wiggle-room, and we’re even taking a retreat in mid-March to hammer out all the details. Our plan is to get everything together for the first play-test of MajiMonsters by summer, then follow up with a second one in the fall. We’ll also be using the time in between to accrue and produce everything necessary for the Kickstarter- rewards for backers, art for the rulebook, etc. We want to have a physical copy of the book in our backers hands in a year’s time, and we’re committed to that goal. Absolutely Tony! Many of our backers have expressed interest in using MajiMonsters to introduce their kids to RPGs. That could be good for kids who grew up with Pokemon.